On arrival at Darwin Airport you will be transferred to your hotel by private car. 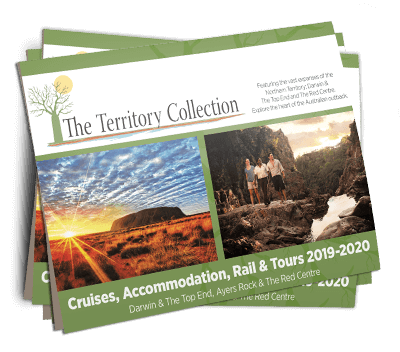 This afternoon enjoy a tour of the tropical city to see old Government House, the new Northern Territory Parliament building and more. Join your Travel Director at the colourful Mindil Beach Sunset Market, where you’ll toast the spectacular sunset with a couple of cooling beverages under the coconut palms before dinner. You may like to try some succulent fresh BBQ seafood, authentic Indian or Chinese cuisine or even Greek or Japanese. Today you’ll depart Darwin and travel to Litchfield National Park, famous for its waterfalls. Your first stop is an amazing stand of Termite Mounds. You’ll continue on to view the beautiful waterhole at Florence Falls from a high vantage point before venturing on further to tropical Wangi Falls for a relaxing swim in the large crystal-clear pool surrounded by spectacular monsoon rainforest. Later, you’ll journey to Katherine. Today join local Aboriginal guides for a walk to follow ‘the Footsteps of our Ancestors’. Learn about bush tucker and traditional bush medicines and see damper and kangaroo tail being prepared and cooked in hot coals before a Be My Guest BBQ lunch. Afterwards join in activities including traditional painting, fire lighting and spear throwing. This evening sit back and relax in tranquil surroundings on a Katherine Gorge dinner cruise. Discover the history and culture of the Jawoyn people, traditional owners of Nitmiluk as you explore two gorges with a backdrop of stunning rock faces that change colour as the sun sets. You’ll indulge in a three course candlelit dinner featuring fresh local produce prepared on board the boat. This morning stop at Edith Falls with the opportunity for a swim. You’ll then pass through the gold mining town of Pine Creek. Travel deep into World Heritage listed Kakadu National Park. The focal points of Kakadu are the spectacular escarpment and abundant wildlife, including over 280 species of birds. After lunch, visit Warradjan Cultural Centre to view informative displays and exhibits, before taking a guided walk to view ancient Aboriginal artwork at Nourlangie. This morning you’ll visit Ubirr and view Aboriginal rock art dating back some 20,000 years. Climb to Nadab Lookout at the top of this rocky outcrop for superb views over the flood plains and escarpment country. You’ll stay tonight in private permanent safari tents at Wildman Wilderness Lodge. This evening celebrate your Top End Highlights holiday at a farewell dinner with your Travel Director and new-found friends. This morning you’ll take a safari cruise on the renowned Mary River Wetlands and Corroboree Billabong. Your local guide will share with you all the secrets of these ancient waterways. This region is home to the largest concentration of saltwater crocodiles in the world and you may also spot wild buffalo and wallabies at the water’s edge. Bid farewell to your fellow travellers as your holiday concludes this afternoon in Darwin.